"Surf" has a new meaning for five students at the Albert Nerken School of Engineering this summer. The Summer Undergraduate Research Fellowship (SURF) gives them the opportunity to conduct their own research projects when the school's labs might otherwise be dark. SURF organizers took the unusual step of soliciting research proposals directly from current undergraduates rather than through faculty sponsors. The five accepted Fellows have been working with professors Oliver Medvedik, David Wootton, and Philip Yecko to fine tune their ideas and bring them to fruition over a 10-week period. The William H. Sandholm Program in Biology, which supports the work of the Maurice Kanbar Center for Biomedical Engineering, funded the program. For that reason the five proposals—from Devora Najjar, Alexa Orrico, Nicholas Gao, Andrew Wentzel and Joe Hua Fung—all focus on research related to bioengineering. At a recent weekly meeting, each student gave a presentation of his or her project while classmates, a teaching assistant and Professors Medvedik and Wootton weighed in with questions and suggestions about experiment design. 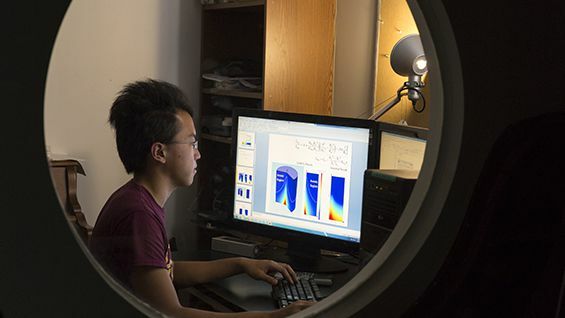 Joe Fung, a rising senior in chemical engineering, described his work to verify the accuracy of a computer model of oxygen transport in a multiphysics software package called COMSOL. Using equations derived by famed Danish physiologist August Krough (1879-1945) as his benchmark, Joe modeled two mechanisms of oxygenation in bone tissue: its flow through capillaries and how it is diffused through a capillary into tissue. Joe will use COMSOL models to design porous tissue engineering scaffolds with vascular channels for improved oxygen and nutrient delivery. These scaffold designs could allow tissue engineers to grow relatively large blocks of bone repair tissue in the lab, and give surgeons an option of directly connecting tissue-engineered bone implants to the vascular system. While Joe’s project looks at the human body on the microscopic level, Devora Najjar, a rising senior in the chemical engineering department, took on part of a project with a broader lens. Her work will contribute to discerning and mapping urban microbe populations— all living organisms like bacteria and fungus that can’t be seen with the human eye. Devora believes that most people mistakenly associate the word “microbe” with biological warfare. “I want to change the perception of microbes as something to be feared,” she said. The microbes will be collected via bees and their honey to avoid any complications that result from taking air samples. She is designing hardware for tracking information in hives that will be placed in London, Paris, Tokyo and New York. Eventually Devora’s work will contribute to a data visualization project started at the MIT Media Lab. Andrew Wentzel, a rising senior in mechanical engineering, is studying how nanoparticle-based magnetic fluids called ferrofluids can be controlled remotely for drug delivery. Andrew aims to build simulations of ferrofluid in blood vessels with the goal of using a laser experimental system called particle image velocimetry (PIV) to visualize the fluid dynamics of blood flow around a magnetically concentrated ferrofluid. To be effective in chemotherapy, for example, the ferrofluids must remain concentrated near where a tumor is located. This requires a carefully designed combination of fluid properties and magnetic fields. Andrew's experiments could eventually aid in methods of delivering drugs directly to a tumor or another specific site in the body, requiring less drug volume and reducing systemic damage elsewhere in the body. The other two projects include the work of Nicholas Gao, a rising sophomore in civil engineering, who is trying to make lab-assisted homologous recombination—in which sequences of DNA are exchanged—more efficient by creating a customizable DNA cutter. The goal is to more accurately find the location where the DNA should be cut, making the recombination outcome more predictable. Alexa Orrico, a rising senior in chemical engineering, is developing a means for detecting toxins in water by using bacteria molecules that can sense the presence of heavy metals. Her proposed system improves upon current methods in which such bacteria frequently die during storage and transport.